A fall safety net is a horizontally spanned safety net with a border rope pulled through the border meshes. Fall safety nets are deployed to catch persons when it is impossible to directly prevent a fall. The nets are, for example, used to catch persons working under hall roofs and in bridge construction. In contrast to catch-rope safety devices, with a net complete freedom of movement is preserved. It functions as a collective protection for all work and transportation processes in the secured area. 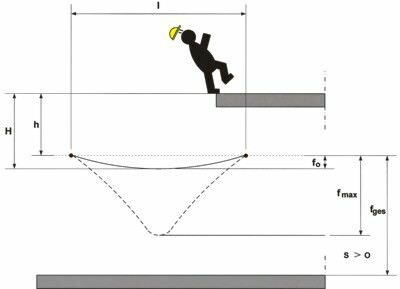 Due to the net&apos;s highly elastic deformation, falling persons are caught more softly than with roping safety equipment. When in a new condition, a safety net must have a reserve capacity that covers at least one year&apos;s ageing. 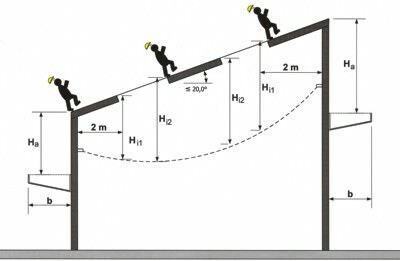 When testing static energy absorption capacity, a 3 x 3 m test net with a safety factor of 1.5 must cover at least one year&apos;s ageing. Our safety nets have an even greater safety margin and therefore offer the greatest possible safety (see table below). Building-site nets have to be anchored at stable, load-bearing points. For measuring each suspension point a characteristic load of at least 6 kN with an angle of 45° must be adopted. For measuring building components three characteristic loads of 4 kN, 6 kN and 4 kN at unfavourable points must be considered. The suspension points must not be positioned more than 2.50 m apart. The net is mounted using suspension ropes, safety snap hooks, net thimble loops or thimble hooks. The breaking force of the suspension rope must be at least 30 kN in the case of single-strand suspension with suspension ropes, and must accordingly be at least 15 kN in the case of double-strand suspension. You can find further safety guidelines in DGUV rule no. 101-011. 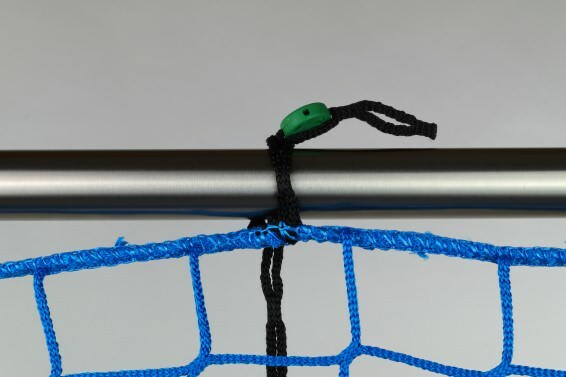 Safety nets must be mounted as close as possible below the workplaces which are to be secured. 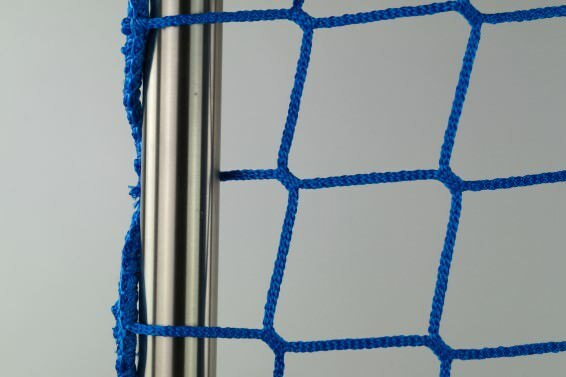 The fall height (Hi2 = difference between the building edge and the height of landing on the net) must not exceed 6 m. For up to 2 m from the edge of the net (Hi1), the permissible fall height must not exceed 3 m.
Safety nets must be mounted in such a way that when arresting a fall, the person cannot hit any hard objects. The degree of deformation depends on the shortest side of the net and the fall height (see table and illustration). In addition to the deformation, a safety clearance S > 0 must be observed for traffic routes, etc. With appropriate documented evidence of conformity from the manufacturer and a fall height of up to 2 m, nets can also be deployed with a clearance of 3 &dash; 5 m below the building edge. Only persons who have been instructed by the building contractor can be authorised to install the nets. The persons carrying out the installation work must be given fall protection (safety harness and hoisting platform). Test number of test center which has certified the net. On every safety net, test seals bearing the same identity numbers are attached to the safety net label and the test mesh, to make it clear that the safety net and the test mesh belong together. Not later than one year following the date of manufacture, the first test mesh must be sent to an authorised tester (e.g. manufacturer). That tester ascertains whether the net used still has the necessary stability/energy absorption and keeps a written record of the results. If the test result is positive, you receive a new inspection tag bearing the identity number, which you then reattach to the net concerned. 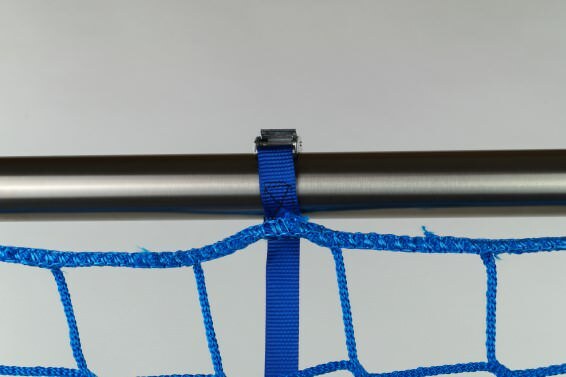 If building-site nets are connected to one another, coupling ropes must be used in such a way that at the attachment point there are no gaps of more than 100 mm and that the safety nets cannot shift in their alignment to one another more than 100 mm. Fall safety nets can also be connected by overlapping them: this overlap must measure at least 2 meters. Dry storage; never store near a heat source; do not bring into contact with aggressive substances such as acids, lye or the like; do not directly expose to UV radiation. Guardrail nets are mainly deployed for work on roofs. Other application areas are work on platforms or in bridge construction. They serve to directly protect persons from falling. The precise designation for these nets is Guard Net System U (guard net in supporting structure for vertical use). In deploying the nets, the intermediate rail can be dispensed with. They are mounted on roof safety scaffolds or at the working level of facade scaffolding. The relevant regulations for guardrail nets and nets in roof safety scaffolds are European Standard EN 1263-1 and Bau-BG regulation no. 179. Furthermore, they must display adequate weather-resistance and be resistant to UV radiation. In addition, the mesh size must not exceed a maximum size of 100 millimeters. Our nets fulfil these requirements. Guardrail nets must be anchored to the scaffolding rail and stretched taut. We recommend installing guardrail nets using Isilink clips (German Federal Utility Model (DBGM)), which are sewn onto the guardrail nets at maximum intervals of 75 cm in accordance with the requirements of Bau-BG safety regulations. All standard sizes are available with clips already sewn on. A quick, easy installation method is to anchor the net using quick-release strap fasteners every 75 cm. These are available as accessories at our shop. Some guardrail nets in standard sizes are available with quick-release strap fasteners already sewn on. Another option is to mount the net directly on the scaffold tube. Pursuant to Bau-BG safety regulation no. 179, guardrail nets of standard design can be fastened to the supporting structure mesh by mesh. Faulty nets (damaged meshes, damaged border ropes) or nets which have already caught a person are only permitted to be reused after being tested by the manufacturer or by persons with expert skills and knowledge. Repairs can only be carried out by the same experts. Debris nets, often also called scaffolding nets in the trade, provide optimal protection from dust and additional protection from small falling parts. They can be mounted on scaffoldings quickly and easily. In Berlin, for example, the guideline “Preventing and Reducing Dust Emissions on Building-Sites” requires “protection from harmful environmental influences”. A further requirement is: “precautionary measures to prevent hazards, serious hindrances and serious nuisances”. It is therefore, at all events, sensible to install a combination of guardrail net and dust debris net. Thick dust caused by demolition or other work can be held back by debris netting. Due to their monofilament raschel fabric or polyethylene fabric, they have the optimal material density for reducing the sometimes hazardous emissions of dust to a minimum. At the same time, they are still air permeable enough to prevent the kind of heat that builds up under non-permeable tarpaulins. Due to their material properties, these nets benefit not only passers-by but also the personnel themselves: the danger of falling is minimised, thanks to the windbreak effect of scaffolding nets.